China's Foreign Ministry spokesman Hong Lei gestures during a daily briefing at the Ministry of Foreign Affairs office in Beijing, April 5, 2016. China has moved quickly to silence any discussion about the Panama Papers and information about the use of tax havens by the families of at least eight current and former top leaders, including the brother-in-law of President Xi Jinping. Massive wealth accumulated by the families of China’s ruling party members has long been a big concern in the country, where its discussion has long been tightly controlled. On Tuesday, searches on Chinese-language sites brought up links to online coverage of the massive document dump. Aside from stories about sports stars, most were blocked. 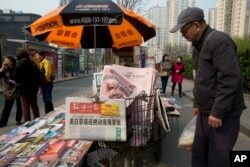 A man looks at a newsstand with a copy of the day's Global Times displayed on a basket in Beijing, April 5, 2016. The nationalistic tabloid published an editorial saying an unidentified "powerful force" was behind the documents leaked from a Panama-based law firm that name relatives of current and retired Chinese politicians, including President Xi Jinping, as owning offshore companies. On social media, discussions about the documents released by the International Consortium of Investigative Journalists were heavily censored. According to the website Freeweibo.com, the top 10 blocked phrases on Tuesday included both the English and Chinese words for "Panama" and the Chinese equivalent of "Panama documents." One post, no longer accessible, read: "Tax havens are quite common and reasonable for business people, but where is all of this tax-free money that officials have coming from?" The clampdown puzzled some people and fueled speculation among others. A user named Space Out said: "I don't understand why the phrase Panama Papers has been labeled a sensitive term. So far, our country hasn't been negatively impacted.... Is it because [authorities] have foreseen they will have something to do with us?" Another said: "It turns out that the Communist Party has no desire to enlighten the public about this. I guess many top leaders are involved." Some blotted out Panama's full name in Chinese or substituted the English Romanization version with spaces to try posting on social media, but their comments still were blocked. The censorship was so extensive that some joked Panama had disappeared. "Obviously, ba na ma (Panama) is a sensitive phrase," one user wrote. The censorship dragnet caught up user 1874 BC for posting a screenshot of an article on the documents and commenting: "Little is said at home about the biggest story in the world, whose coverage is blocked on Weibo." Another said: "The Panama Papers story, which I just finished reading, was deleted in the blink of an eye. So fast. Nothing can be found on Baidu," the popular Chinese search engine. 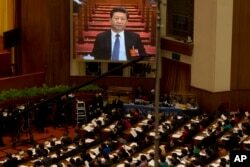 FILE - Chinese President Xi Jinping is displayed on a large screen during the opening session of the annual National People's Congress in Beijing's Great Hall of the People, March 5, 2016. While most Chinese publications were silent, the Communist Party-backed Global Times newspaper ran an editorial in English and Chinese arguing that the massive document dump focused overwhelming criticism on non-Western leaders. The editorial did not mention any of the divulged documents related to President Xi Jinping's family, the daughter of former Premier Li Peng, or the granddaughter of senior official Jia Qingling. But it noted that Western media were giving "extra spin" to documents linked to Russian President Vladimir Putin. In the Internet era, disinformation poses no major risks to influential Western elites or the West, the editorial said. "In the long run, it will become a new means for the ideology-allied Western nations to strike a blow to non-Western political elites and key organizations." So far, the International Consortium of Investigative Journalists has published documents related to four top Chinese communist party officials on its website. According to the documents, the president's brother-in-law, Deng Jiajun, in 2009 became the sole director and shareholder of two offshore "shelf companies" – corporations with no activity. 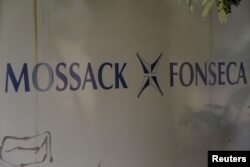 Both were in the inventory of Mossack Fonseca, the law firm at the center of the document dump. The ICIJ said that by the time Xi became president in 2013, the companies were dormant. Some of the ICIJ's findings were not particularly new. The document dump included details on Patrick Henri Devillers, a former business partner of the wife of ousted Chongqing Party chief Bo Xilai. Xi's brother-in-law Deng and Li Xiaolin, the daughter of former Premier Li Peng, were mentioned in documents that the ICIJ previously released about offshore holdings. While some information in the files potentially could help China's anti-corruption investigators, it is unlikely authorities will offer much follow-up. Late Tuesday, in its first response to questions about the documents, Chinese Foreign Ministry spokesman Hong Lei was brief: "About these groundless accusations, I have no comment."